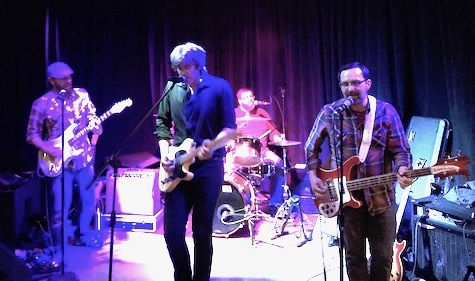 Matt Whipkey and his band at Growler USA, April 1, 2017. First and foremost Growler USA (the joint I wrote about that’s introducing original local music to the great unwashed masses in way West Omaha) is more bar than restaurant than music venue. 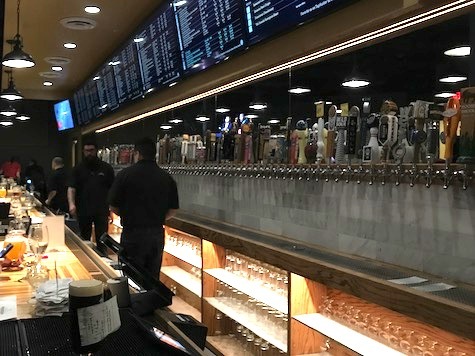 Beyond the name, just take a look at the back wall and the enormous line of beer taps and it’s pretty obvious you’ve stepped into a place designed for drinking. Behind that wall is a kitchen, which serves run-of-the-mill bar food. Finally, tucked in the front corner of the room is triangle-shaped stage surrounded by curtains with a couple over-head PA speakers and digital lighting. For some reason I thought the place would be bigger, with a real stage, but Growler USA is actually quite small, right in line with the 120 capacity reported last week, and designed like any other new-construction West Omaha building — single level open room with windows on one side, nuthin’ fancy. The wall o’ taps at Growler USA. One could argue the novelty of having 100 beers on tap would be enough to keep the place filled. In fact, when I arrived at 8:30, there was nary a table to be had. Owner Brent Malnack found us a spot about 10 minutes later while I enjoyed a delicious Millstream Peach Fuzz (no Rolling Rock for me). Burgers and sliders (and tots) were quickly ordered and served. The Matt Whipkey band took the corner stage right around 9 p.m. Matt told me they weren’t going to hold back, and the room held up well to their rock ‘n’ roll onslaught, though the PA sounded overblown toward the end of the set. That said, I can now see why Malnack was discouraging metal acts last week. The room looks better suited for quieter acoustic combos. So did the crowd, which consisted mostly of gray-templed middle-aged couples out having a beer, many of whom were as focused on the North Carolina v. Oregon game as Whipkey and Co. in the corner. I have no doubt that Growler USA will be a smashing success with or without live music. That Malnack wants to provide a stage for original bands when clearly he doesn’t need to is a credit to someone who’s been involved in local music since the ’80s with his band Modern Day Scenics. That said, West Omaha still needs a real music venue. Back to Whipkey… I haven’t seen him and his band in a year or so. They’re still cranking out the Americana, but two songs played Saturday night were as heavy as anything heard ’round town. The rhythm section of Travis Sing on bass and Scott “Zip” Zimmerman on drums is first class (Travis was particularly tight, while Zip seemed restrained, especially compared to his Ocean Black onslaught). I could barely hear second guitarist Korey Anderson over Whipkey’s own guitar, which was guttural, especially on his grinding solos. Give me the heavy stuff, Matt. Tonight Seattle band Dude York (Hardly Art Records) headlines a show at Slowdown Jr. that includes Glasgow indie band Paws (FatCat) and our very own Uh Oh. $10, 8 p.m.